XenMobile offers transparent, highly secure micro-VPN connectivity behind the corporate firewall. Intune provides application layer data protection for Office 365 mobile apps without affecting end user experiences. Today, customers no longer have to choose between the two. XenMobile is the first unified endpoint management (UEM) solution to integrate with Microsoft Intune, leveraging Intune application programming interfaces (APIs) in Microsoft Graph. This integration allows administrators to work in a single Citrix Cloud console to manage both XenMobile and Intune App Protection policies for greater security. You can use whichever platform you want for mobile device management (MDM). The real magic happens at the mobile application management (MAM) layer. For MAM, you can use XenMobile MAM with Intune App Protection for greater security and productivity. For example, with XenMobile you can provide your users with a unified app store, so they can access their Office 365, mobile, SaaS, web and legacy desktop apps, and manage all of these apps in one place. 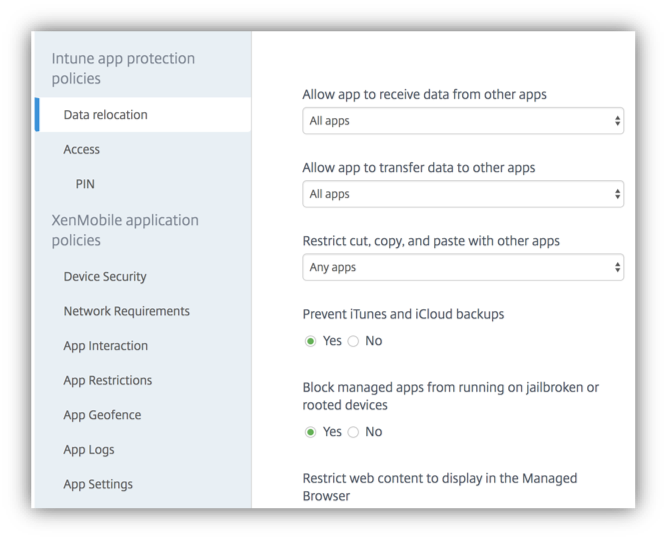 In the screen shot below, you can see Intune App Protection policies and XenMobile MAM policies sitting side by side in the Citrix Cloud console. Additionally, only XenMobile offers Citrix mobile virtual private network (microVPN or mVPN) capabilities which can be leveraged by Intune-managed apps such as Microsoft Intune Managed Browser. With Citrix mVPN, your users will have secure access to data behind your firewall. Citrix mVPN protects data whether in transit or at rest using Citrix encryption, rather than relying on the device’s native encryption. Additionally, you may provide your Line of Business apps with this Citrix mVPN security by integrating these apps with the Citrix MDX SDK. To prevent data leakage, personal mobile apps (like the native iOS mail or Notes) not managed by Intune cannot interact with the Office 365 mobile apps. So, if you cut some text with company data from a Microsoft Word document and tried to paste it into the personal Notes app, you would receive the message “Your organization’s data cannot be pasted here,” and the operation would fail. This helps to keep company data protected. Alternatively, XenMobile includes a fully encrypted business-grade secure mobile email client, Secure Mail, which can be managed by Intune App Protection policies to provide data leakage prevention. Secure Mail works seamlessly with Office 365, allowing attachments to be securely opened in various Office 365 mobile apps. For example, with Secure Mail a Word document attachment can be opened and edited securely – all within the Intune App Protection container. Finally, if you use an on-premises Exchange server, then on a per app, per device basis the Citrix mVPN provides a direct link from Exchange to the mobile device. This eliminates data/credential caching and provides double the encryption – using Citrix encryption rather than relying on the device platform encryption. With XenMobile Service you now can securely deploy Office 365 and other apps to your mobile devices with the confidence that your data is secure in motion and at rest. Citrix Secure Apps like Secure Mail can be managed with Intune App Protection policies insuring seamless and secure interaction with Office 365 mobile apps and providing users with a great endpoint experience. And all of this can be managed in one place, the Citrix Cloud console. This flexible solution allows our customers to benefit from strengths of both Microsoft Intune and Citrix XenMobile. The latest release of XenMobile Premium and Advanced Services – Available Now – includes this new integration with Intune. Already a XenMobile Premium or Advanced Service customer? The features provided by this integration with EMS/Intune must be turned on by Citrix Cloud Ops, so contact your local Sales rep and/or SE to discuss the details and schedule a time. Click here for more information about how XenMobile adds value to Microsoft EMS/Intune for Office 365. Should you have questions or need support for XenMobile, there are many ways to get help, such as Citrix Support, your reseller, Citrix User Group Community and Twitter. I recommend that you start by talking to a XenMobile expert who is ready to help answer any questions you have — from technical details to purchasing options. You can contact Citrix directly or contact one of our local partners. New Citrix Mobility Master Class! Citrix TIPs Series: Stump the architect!